Pretty exciting stuff. First two finishes of the year finally getting their pix taken. On to the next one! Sometimes deadlines are really annoying. But then they hopefully turn into shows, so there’s that. I have an opening tonight at Mesa College for Subterranean…two of my pieces are in that. 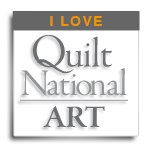 I’ll be at the opening after I drop my quilts. None of those details are mine. One of mine made the press release. I’m good with that. Hopefully I’ll have some show photos later today. The opening is from 5-7 PM. I’m a little spacey this morning. Blood sugar was really low. I have no idea why. Well, I exercised after dinner. Not sure what else. I’m eating. I’m getting better about carrying food everywhere. I ate circus animal cookies yesterday (one of those cute little bags that only has like 5 cookies in it). That’s probably not it. I had a union meeting. It was a weak moment. OK, so two more days of managing the exploding squirrels who are my students. They have work to do, but you know how that goes. It’s not just me being driven nuts by their inability to function…all of us are. Spring Break is late and we are all cranky. The different is that I’m still working. Ah well. Progress reports go home today. That should help. Maybe? There’s a fire drill this morning. Because they hate us? Who picks these days? People who don’t work in the classroom, that’s who. Idiotic. OK. Well, I didn’t get much art-related stuff done last night. I paid my property taxes and my daughter’s college payment and I graded a bunch of stuff and exercised and meditated like a good girl and packed up those quilts and thought about the next quilt. I even looked at the drawing I had already started. I thought about cutting paper the right size. I even thought about what the right size would be. But I didn’t do anything. It’s OK. I’ll get there. Not particularly quickly. I have too much to grade to get anywhere quickly. This guy. Asleep on my foot. He’s a sweetheart, although we’ve been pulling these curly sticks from some bush out of his fur for days and he hates that, because they stick. On certain parts of his body, I just cut them out. It’s easier. OK, go to school, live through fire drill and kids not working, get some grading done, hopefully don’t have to yell at anyone or lose my mind. Then deliver quilts and go to exhibit and wonder at the art. Come home and eat and do some stuff. Hopefully draw. That’s where I want to be. I might even embroider. It could happen. The only thing that’s stopped me so far is finding the appropriate needle. Ironically, because there’s probably a few hundred needles all over this house. Hopefully not in the carpet. Should I worry that my left eye is twitching? No. I should be glad that I got this late in the school year before it started up! Yaaasss!